Although glomerular endothelial dysfunction and neoangiogenesis have long been implicated as factors contributing to diabetic kidney disease (DKD) pathophysiology, the molecular basis of these processes is not well understood. The authors previously found that a proangiogenic gene encoding leucine-rich α-2-glycoprotein 1 (LRG1) was upregulated in isolated glomerular endothelial cells from diabetic mice. In this work, they demonstrate in a diabetic mouse model that LRG1 is a novel angiogenic factor that drives DKD pathogenesis through potentiation of endothelial TGF-β/activin receptor-like kinase 1 (ALK1) signaling. They also show that plasma LRG1 is associated with renal outcome in a cohort of patients with type 2 diabetes. These findings indicate that LRG1 has a pivotal role in DKD pathogenesis through TGF-β/ALK1 signaling and is a risk factor for disease progression. Background Glomerular endothelial dysfunction and neoangiogenesis have long been implicated in the pathogenesis of diabetic kidney disease (DKD). However, the specific molecular pathways contributing to these processes in the early stages of DKD are not well understood. Our recent transcriptomic profiling of glomerular endothelial cells identified a number of proangiogenic genes that were upregulated in diabetic mice, including leucine-rich α-2-glycoprotein 1 (LRG1). LRG1 was previously shown to promote neovascularization in mouse models of ocular disease by potentiating endothelial TGF-β/activin receptor-like kinase 1 (ALK1) signaling. However, LRG1’s role in the kidney, particularly in the setting of DKD, has been unclear. Methods We analyzed expression of LRG1 mRNA in glomeruli of diabetic kidneys and assessed its localization by RNA in situ hybridization. We examined the effects of genetic ablation of Lrg1 on DKD progression in unilaterally nephrectomized, streptozotocin-induced diabetic mice at 12 and 20 weeks after diabetes induction. We also assessed whether plasma LRG1 was associated with renal outcome in patients with type 2 diabetes. Results LRG1 localized predominantly to glomerular endothelial cells, and its expression was elevated in the diabetic kidneys. LRG1 ablation markedly attenuated diabetes-induced glomerular angiogenesis, podocyte loss, and the development of diabetic glomerulopathy. These improvements were associated with reduced ALK1-Smad1/5/8 activation in glomeruli of diabetic mice. Moreover, increased plasma LRG1 was associated with worse renal outcome in patients with type 2 diabetes. 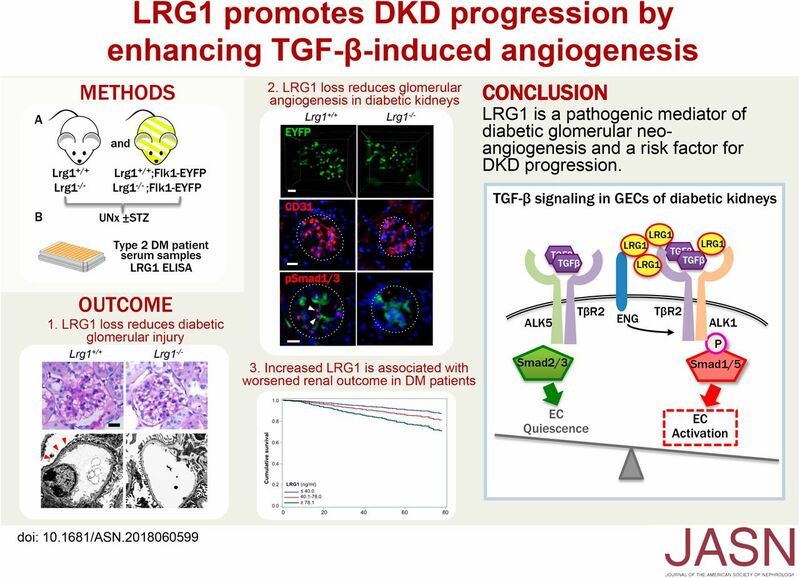 Conclusions These findings identify LRG1 as a potential novel pathogenic mediator of diabetic glomerular neoangiogenesis and a risk factor in DKD progression.